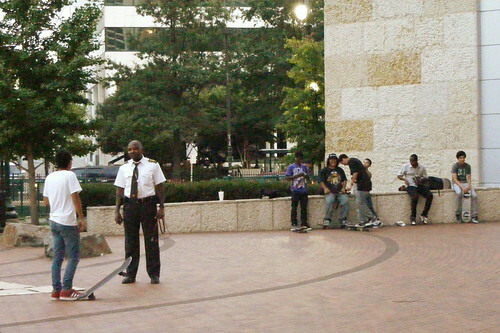 Skater kids, shown here in front of the Discovery Building, are the sole users of many Downtown spaces but are often chased out of them by security. Check out this photoset of pocket parks. If you'd like to put up a building in Downtown Silver Spring, chances are you'll be asked to set aside some land for a garden, a park, or a plaza, spaces which will probably look nice but never get used. 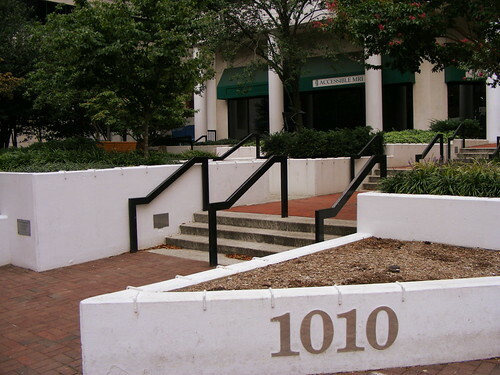 Pocket parks on the south side of a building will receive no sunlight and thus can get too cold to sit in. Those too far from food become inconvenient as a place to eat lunch. (And you can be too close to food, like the park next to the McDonald's at Colesville and Second, where the air is thick with salt and lard. Mmm, special sauce!) 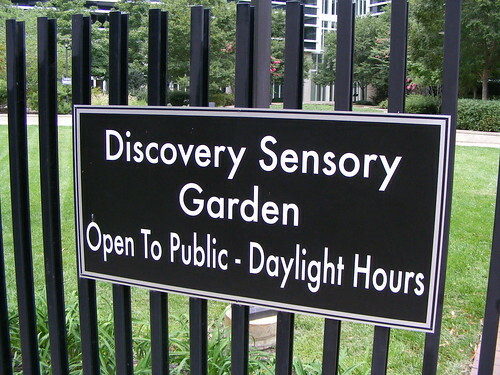 And a few, like Discovery's Sensory Garden on Wayne Avenue - a public amenity! - are even gated, preventing anyone from actually getting in. These spaces have few users because they're designed to discourage loitering; so few, in fact, that the Planning Board wants to prevent the building of more pocket parks in the future. So Downtown's rotating cast of skater kids show up instead. Occasionally, you'll see them sharing the space with homeless men who for once aren't the ones getting hassled by police. They'd be found outside the Lenox Park apartments at Colesville and East-West Highway, or in the park above the Silver Spring Metro station where I'd wait for the bus. Last year, the County closed off a block of Ellsworth between Fenton and Cedar for kids to skate each weekend in the place they'd be congregating in anyway. It turned into a little show: complete strangers would gather to watch them do tricks. But they were pushed out by shopkeepers who complained that their customers were scared away. In August, the floating skate-and-homeless session moved to the plaza outside of the Discovery Building at Georgia and Wayne. For the first time since it was built nearly ten years ago, you could see life in this space as some twenty or so kids gathered there each weekend with skateboards and bikes, doing tricks off the planters and boulders that furnish it as homeless men watched the action from benches between naps and reading the newspaper. But in the month or so it's taken for me to write this post, they've since dispersed, chased away by a cherry-picker dumped in the plaza for some construction project that never seemed to materialize. We have to find more reasons for people to use new pocket parks, like this one outside the Veridian on East-West Highway. Retail is one option, but so are entertainment or recreational activities. After watching the jungle gyms of my childhood carted away from Woodside Park at Spring and Georgia, I was heartbroken. But I'm glad to hear that the park's renovations include a new temporary skate spot along First Avenue, to open as early as January. Neighbors who had kids grinding down their front steps last spring will likely be relieved, but I wonder if kids will actually use the space enough to make it permanent. Skater kids deserve a chunk of the public realm, because they'll vote with their feet (er, wheels) and if not given a space to go they'll make one themselves. There's a potential danger - both for them and for property damage - in kids misusing (or reusing, depending on how you see it) the furniture of the urban environment. And some of these kids don't know to act in public. But if we're going to require developers to build these little useless pocket parks, why don't we turn one or a few of them into legitimate skate spots? You're allowing them to make a public contribution that actually contributes to the public. LEFT: The Discovery Sensory Garden on Wayne Avenue, a public space, is fenced off. Hell, why don't we give them all recreational uses? People, especially people who sit down all day, are becoming fat. (In the three months since I got a desk job, I have gained fifteen pounds. It doesn't help that unlike in college, I can actually afford to eat.) It makes sense to turn these little unused spaces into opportunities for physical activities other than smoke breaks: handball courts, basketball hoops, even putting greens. Games that can be played alone or with others and don't require a lot of equipment beyond what you can keep under a desk. Open space is a hot commodity in Downtown Silver Spring, and will continue to be as more people come here to live or just hang out. 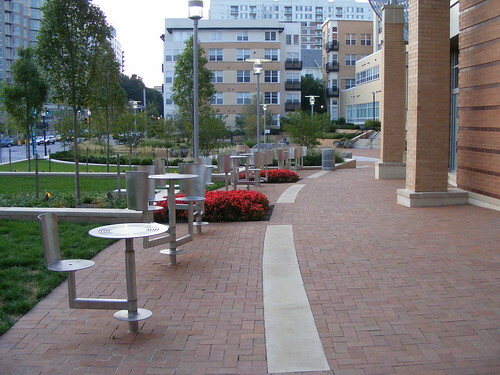 It's imperative that we ensure that these spaces are not just attractive but usable as well. Not every park has to have a tree and benches. Creating a variety of pocket parks that can be used for a variety of activities is the way to keep the area vibrant and healthy. Check out this photoset of pocket parks. Great essay! Just wanted to add that it is the unused spaces that end up becoming the potentially dangerous spaces. If you chase away those with a legitimate use for the space, you will get very bad results. I thought that was Urban Planing 101. I do think there is some value to passersby of having open/green space to see, even if they don't stop and hang out in it. How about this - require the benches, etc., in the pocket parks to be made out of materials that won't be harmed by skateboards, and let the skaters have at 'em. How much damage could they really do to those funny metal tables in your picture, for example? There's a gate around the Sensory Garden, but I've never had any trouble sitting in there. The fence + gate - despite the sign - does make it seem unwelcoming at Discovery. Agreed that the spots of green - even small ones like tree boxes and planters give some visual and psychic relief. However, all these pocket parks seem to be are piles of concrete and rocks -- and who but skateboarders is interested in occupying that dead space? It is ironic, as Dan points out, that developers build these "pocket parks" almost to the exact specs of what a skateboarder would desire and then kick them out when they use it. There is a disconnect at a basic design level here. The community wants/needs/begs for green space and relief. These are not the solution. Right now there's not a single spot where skateboarders can legally skate in downtown Silver Spring (or any other part of Silver Spring.) We get kicked out from every spot, and security guards scream at, harass, and even attempt to grab and tase kids for skateboarding. They're good kids and they deserve better treatment. And they deserve to have a legal, safe place to skateboard.